"Why is that if a ship sinks in the first 20 minutes of its maiden voyage, they build it a museum?" 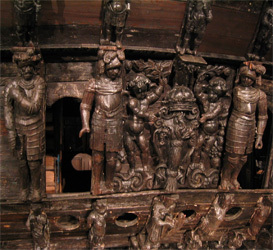 So asked the Star Princesses' captain as he told us all about the Vasa on the evening before we reached Stockholm. To answer his question, we're all fascinated by failure and catastrophe. 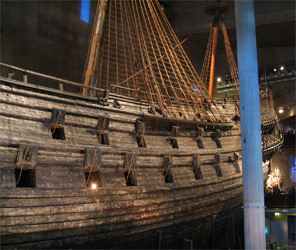 And it is a fascinating site -- an enormous ship built in the early 17th century, 150 years before shipwrights really learned how to build sea craft this large. 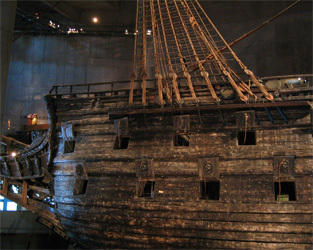 This would-be flagship of the Swedish fleet was doomed by the king's meddling. Eyeing the ship under construction, he asked the builders to add another gun deck on top. 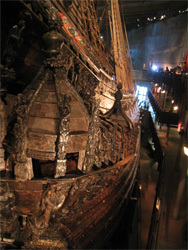 The top-heavy Vasa only sailed for about 20 minutes before a gust caught its sails and eased it over onto its side, after which it sank, taking 150 souls to Davey Jones' locker. Swedish engineers raised it up in the early 1960s, remarkably intact, thanks to the cold and semi-fresh water.